More Oscars Updated with Old Material! Here's this week's Almanack, too late to do you any good. And here's an Oscars Preview from about 2003 with a few Teeny Tom Cruise jokes. And some other references that might be a little dated. But there is a flying-cummerbund joke, and of course those are always funny. It's not too late to order cookies from my younger daughter, you know. 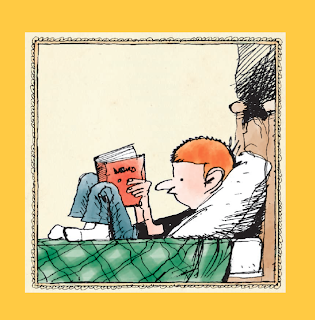 This was for the New Yorker last week. I kept redrawing it because of 11th hour panic, which is where the caricature suddenly ceases to look like its subject just as you're finishing it. I couldn't get his smile right. This is close enough. This is an old Almanack. I've done an Oscar (R) cartoon maybe six times, and they've usually included Tiny Tom Cruise getting his arm stuck in his chair's cup-holder or falling between the seat cushions and nobody noticing. This was the first of them and probably my favorite, even though there are no actors caricatured. We used to have an Oscar (R) party, with a pool for the winners and various props and novelty food items. The first year it was an Oscar (R) statue made of cream cheese. The most epic was a twenty minute version of Titanic that my wife made using toys from our daughters' toybox, and a mock-up of the ship that actually split in two and sank to slide-whistle accompaniment. She brought it all in under budget for about $62. Boy, she hated that movie when we saw it in the theater, and it really showed in the parody. Someday it'll make its way to Youtube, and she'll be voted an honorary Oscar (R) for services to mankind. This is a cover I just finsihed for Electrical Contracor Magazine, art directed by the mighty Bono Mitchell. I think it's purty. 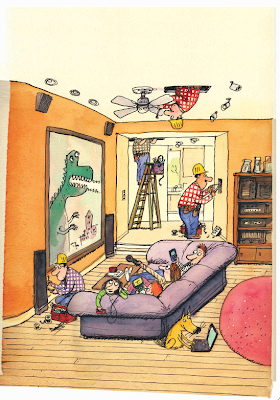 I wish my house looked like this, maybe without the yellow dog. Or I wish I had a yellow dog like that, and forget the house full of gizmos. Mille grazie di "Balloon- il blog delle comic strip"! I think they were saying nice things . The Babelfish translation made it difficult to tell, though it was vastly entertaining in itself. Here's Saturday's Almanack, drawn quickly when the lengthy, complicated cartoon I'd planned didn't work. My excuse is: when will I get another chance to draw Ron Paul? I think it's awfully nice that presidents get their own day. Do you think they get special deals at family-friendly restaurants on their very special day? In the Midwest there used to be a restaurant called Bob Knapp's that offered patrons a birthday deal where you'd get a percentage off based on your age; if you were ten you'd get ten percent off, if you were 100 you'd eat for free. Anything over 100 and I guess they'd owe you. It's no longer around, maybe because centenarians flocked to it. When my daughter turned four she got four percent off plus a slice of very tasty chocolate cake, and they probably sang Happy Birthday to her. That was a digression. 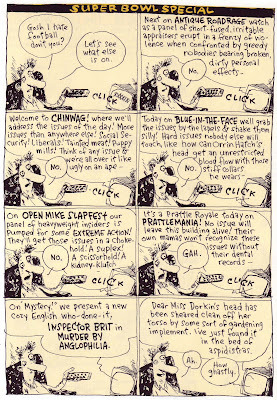 I did this back during the last Clinton administration, when a presidential stain was the stuff of comedy. Not like these days, when a presidential stain is more like Lady Macbeth's. 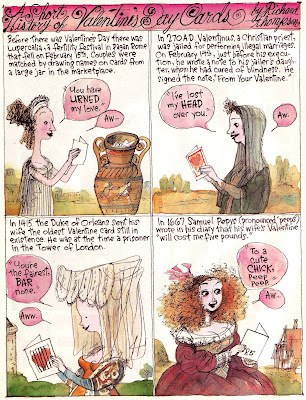 This is also from the Post mag, Valentine's Day '03. And every word of it is true. I was shocked to find out that my editor didn't know that diarist Samuel Pepys' name is pronounced "Peeps", especially as I'd only learned it the day before. I always thought it was Pep-eez, which is actually a stomach antacid. This is Alice's first appearance in print, on the cover of the Valentine's Day issue of the Washington Post Magazine in '04. She's since gotten a haircut and a face-reshaping. But haven't we all? So that big plan for posting an elephant every Monday kinda fell apart. But here's an Elephant for Monday just to catch up, plus a bonus donkey. It's a cover for Contingencies magazine from 1999, the theme being a play on Waiting for Godot. The final is fine, but I like the sketch a lot. This is for Mike & the guys. 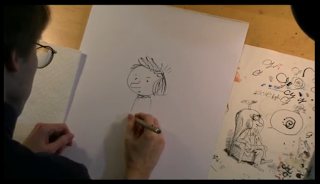 It's from a few years ago and started out as Roz Chast draws Blondie, then grew from there. 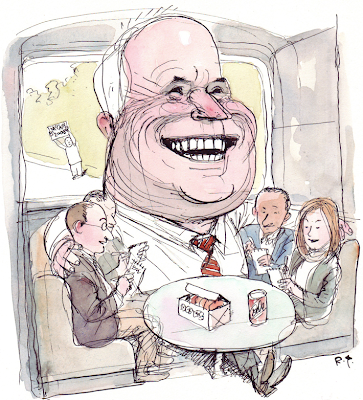 Drawing John McCain is kinda hard; in other words, he doesn't simplify easiely. He's got a wide jaw, a small mouth, a blunt-yet-pointy nose, and twinkly, I-dare-you eyes. I've drawn him a dozen or so times, and this one's my favorite. It was for US News & World Report back when I did a weekly caricature for them, and it appeared soon after McCain lost the '04 nomination. To chill out (hah!) after the pressures of the campaign, McCain and his wife went to the Antarctic to look into the effects of global warming. Plus evidently McCain's a penguin fan, as who isn't? So my advice for drawing McCain is: if you get a chance, draw him with a mass of penguins. I don't know why, but it seems to work. 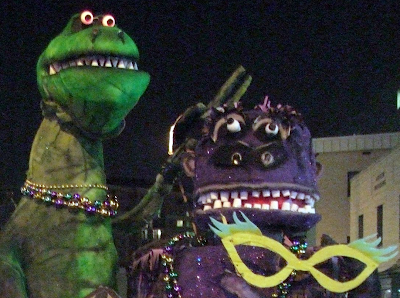 Here, courtesy of Bruce Guthrie and his Unstoppable Camera, are some photos of the Clarendon Mardi Gras float brought to life by the Unstoppable Genius of Rob Lindsay, Vic Ferrante, Jared Davis, Bono Mitchell and diverse hands. Note that the eyes light up and the heads bobble. 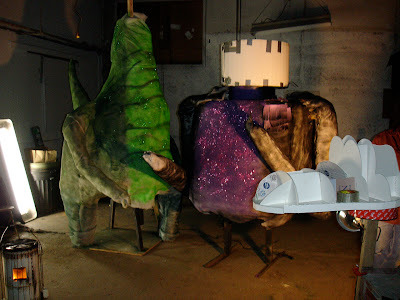 The jeep with the Godzilla in it was towing the float, inside Godzilla is Rob's sister, who also made the costume. Dill Wedekind, Alice's mooncalf friend & neighbor, has at least three older brothers, near as I can figure. Also, from what I can tell, his family are kind of suburban hillbillies; his mom and dad are former late-generation hippies who've lived on farms. So the stuff inside their house sometimes sprawl out into their yard and beyond, just because they're used to outbuildings & sheds & barns. On a farm you can have big projects that get worked on outside, you can tear down buildings and put up new ones, you can build a trebuchet. We had neighbors some blocks over who were probably suburban hillbillies and there was a trebuchet parked in thier driveway for a year or so. In a suburban neighborhood there's no hiding stuff like that, which I like as it makes the landscape more interesting. Their trebuchet is gone now, which is a shame as I heard it wasn't all that successful at throwing things. 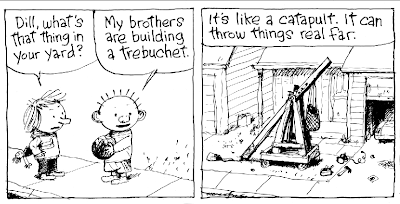 I knew a few people back when who built a trebuchet, and a catapult, and a small cannon that shot onions. 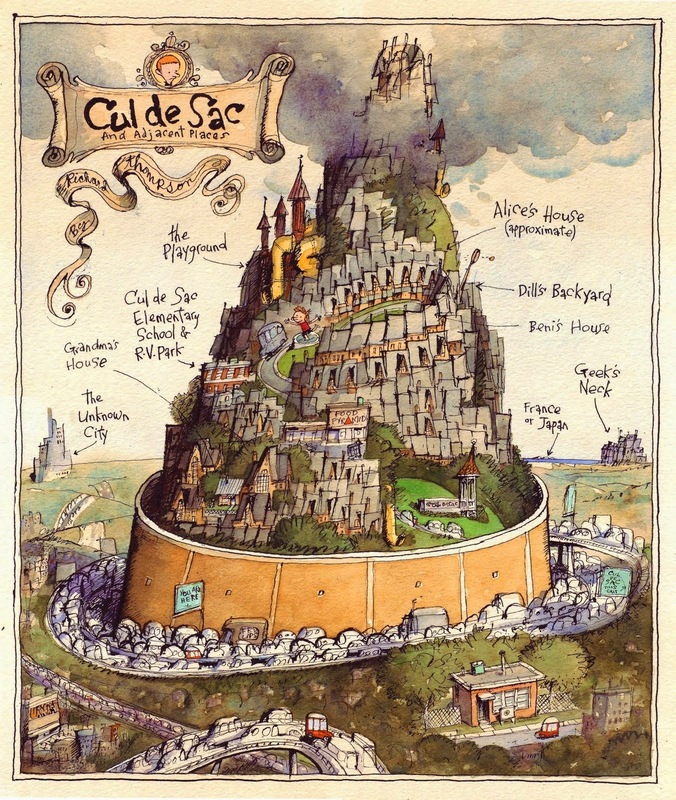 If I was handy I'd build a seige engine, one of those tower things, just to make the landscape more interesting. And maybe earn some cash on the side cleaning gutters. 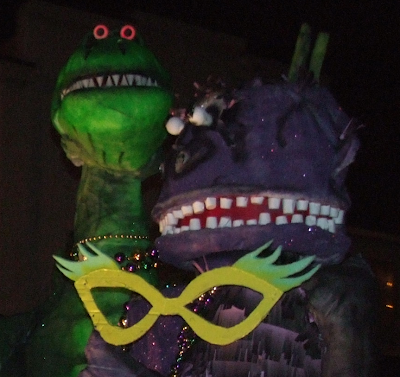 Here's what the Clarendon Mardi Gras Parade float looked like last Friday. It's now completed and I'm told it looks hilariously cool. I haven't seen it yet, but I will tonight, and I hope you will too (refer to the parade poster a few posts below for details). I'm going to be watching this thing from in front of my old friend Bono Mitchell's studio at 2527 Wilson Blvd; if you're there, stop by and I'll sign your arm and throw beads at you. It wasn't belated in the newsprint Post, but they always take a few days getting up their website. Interesting fun fact: Bhlaghraebhnorheachgoinasaigh is pronounced "Gorn". Here's an old Almanac that seems appropriate for today. I don't hate football much except maybe in its more organized form and I don't watch TV chinwag-type shows, so I don't know who this guy on the sofa is. For "Orrin Hatch" please feel free to substitute any politician of your choice.